A blue grouse is in trouble. In my stronger moments, I tell myself it’s going to be okay. That it has been a good run and she has been loved. That she’s been my bird dog and I’d like to think, somehow, that this life I lead is a kind of version of canine heaven. Especially for gun dogs. But I have weaker moments. Sometimes, they come in daylight while she lies in her dog bed beside my desk. Sometimes they come in darkness when I lie awake and listen to the sound of her breathing, a sound not unlike the crackling of plastic wrap in a fist. I’m home this week early, a trip to Oregon’s coastal rivers of steelhead cut short. I don’t mind. I want to be here, not there. It started a month or so ago, the huffing cough like a throat-tickle that can’t be cleared, and in a thirteen year old dog, I didn’t think much of it. But the kennel where I boarded her when we went on holiday vacation is owned by my veterinarian, and she, being an alert practitioner of the medical arts, asked. Have you noticed a cough? So we shot a film and drew some blood and tried a dose of antibiotics, thinking, perhaps, that the shadow in her chest was an abscess from an inhaled grass seed, a common affliction of dogs who drink the wind that brushes bird. A month later, the coughing still there—sounding wetter—and another film. This time a gloom in her lungs like boiled smoke from a slash pile that had jumped the dozer line, metastasized and blown up into a wild fire. Even before a layman’s eyes. There will be no chemotherapy. I will not make her final months any sicker than an old bird dog at thirteen can stand. Six months. In six months, it will be bird season again. Another September. There have been other old dogs. But this one has owned my heart more than any other. This is the one that inspired my friends to buy their own pointing dogs. She has been a spectacular finder of wild birds, a retriever whose retrieves are as memorable as the vision of the Comet Hale Bopp (and only slightly less rare), and never-fail backer of other dogs’ points. She has made so many stunning bird finds that they are lost to my memory just like living at the base of the Tetons makes one forget about the staggering scenery on the horizon. The other old dogs went out of my life without a clock ticking. One day they were old and I could see the dwindle in them and then they were gone. There was no egg timer to the whole thing. So we have six months until bird season. Maybe longer, maybe shorter. Six months of riding in the pickup cab with me, six months of jerky treats, six months of canned dog food and pretty much any damned thing she wants. Six months when I will try to be here rather than somewhere else. Six months and one day, perhaps with September painting the grouse woods and grasshoppers rattling along North Willow Creek where I will do the sad work with sharp spade, I will know. I will know that the countdown to the end of the dog has ended. Sounds like you two will make the most of it. Top of the hat to you both. …thanks for the memories…a very nice read. She’s the real deal, buddy. And so are you. dropped by for a chat with some friends and bought some books. I handed the money to her,she took it in her mouth and completed a nice retrieve to you. I have been there more times than seems fair. 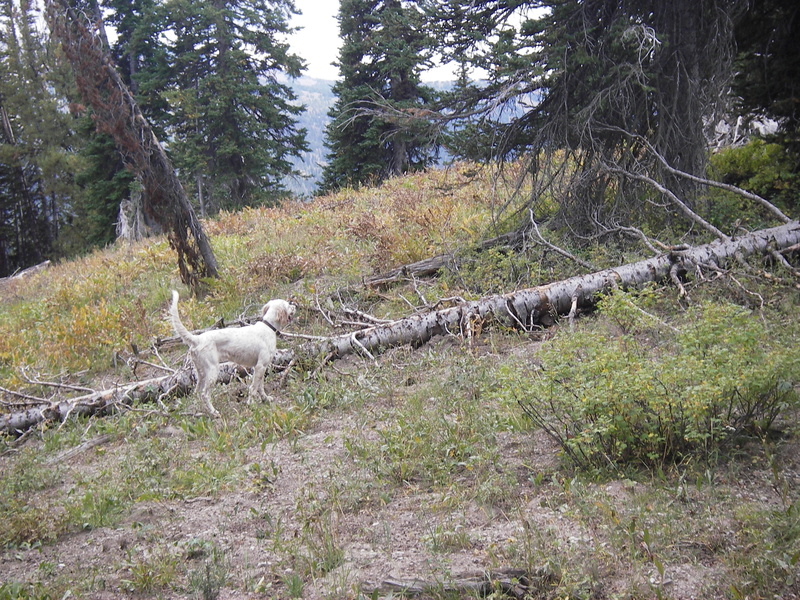 And I’ll soon be there again with a pair of English Pointers,brother and sister out of a special male that I followed in many states on many birds. I put him down 3 summers ago. This pain is tough,but made that way because of the many joys in our outings with these wonderful companions. Canine heaven…and I agree. 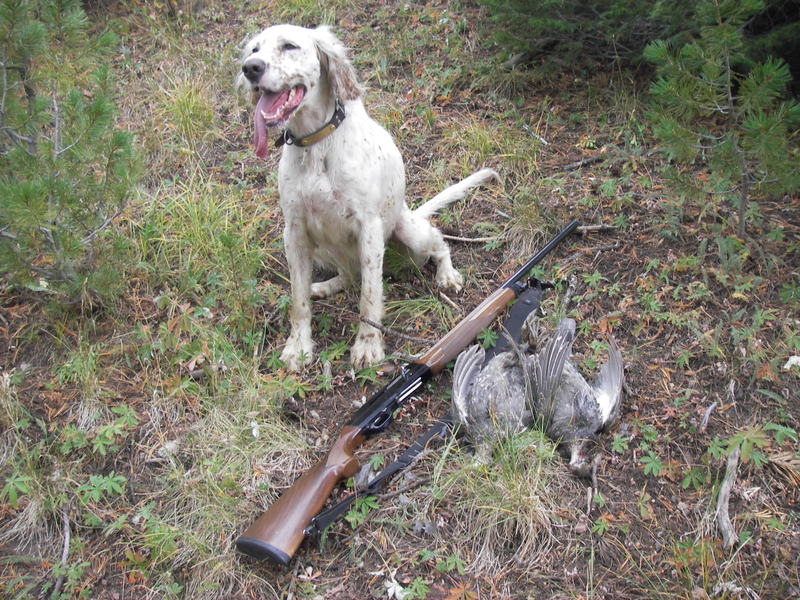 The older I get,the more I love my bird dogs. Take care. Thanks for putting this in words. Loosing dogs is one of the hardest things I’ve been through. Will Rogers said “If there are no dogs in heaven, I want to go where they go…” I feel the same way, and I can tell you do too. Can’t add anything constructive to what you’ve said, but I feel your pain brother. Speechless. With setter girls that are eight+ and ten+, I dread the road ahead. Wish you both the best. Its been a covert well run. It still doesn’t make it easier. Hunt em up pup. What we’ve lost is nothing to what we’ve found. Thats tough. I have always let my bullies hang on until they just gave up. I have one now that is ailing fast, still hanging on but I suspect not for much longer. She is just old. I will not take her in to be euthanized. We did that to a small Jack Russel because he was suffering real bad, but these bullies are just tuff. I really think she wants to be home. Hope it doesn’t hurt to much.